With profound apologies to Omar Khayyam; we’ve come a long way since the 11th Century. 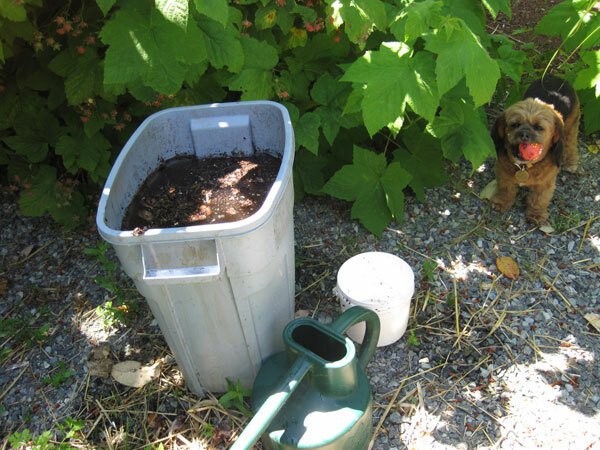 Compost tea and straw are elixirs for the modern gardener. Better than that “jug of wine, a loaf of bread and thou”? Uh, maybe not, but much appreciated by your happy plants. Compost tea is just about the easiest thing to make; it can be as simple or as complicated as you wish to make it. Sure, if you Google ‘compost tea’ you’ll find places to buy it, sources for expensive bubblers and aerators, and these are all wonderful no doubt. However, my version is just like the bag-in-a-cup way of making real tea; a shovelful of good compost in a 5 gallon bucket, fill with water (ideally rainwater, but second best is to allow the water to sit for a day or two to dissipate the chlorine, but I’ve never had the patience for that), and allow to steep for 3-5 days, stirring daily to incorporate oxygen into the brew. Any longer than that, without an aerator, there can be too many anaerobic organisms, and a never-ending supply of mosquito larvae! When ready to use, stir vigorously, muttering incantations to the moon of course, allow the solids to settle, and scoop. I keep a yogurt container handy, scoop some into my watering can, and fill the can with water. Depending on what I’m watering, i.e. seedlings or my established perennials, I’ll dilute or not. Full strength is a real treat for shrubs and all other plants, but it can be diluted up to 1:5 ratio with water, and still be an energizing fix for the hungry plants. To make the tea even more deluxe, you can add a few cups of alfalfa pellets, or a good slosh of liquid seaweed. The alfalfa adds nitrogen, and the seaweed contains about 60 micronutrients, beneficial fungal foods, and plant growth hormones. Used as a foliar feed or soil drench, the tea feeds a very nutritious tonic to the plants, inoculates the soil with beneficial bacteria and fungi, and helps control plant diseases. Add the remaining sludge back to your compost to return an active community of microorganisms to the pile. Recycling at its best. He claims that there are enough aerobic bacteria and fungi in a good 5 gallon batch of compost tea to equal the benefit of 10 tons, or 40 cubic yards of good compost. Well, I can’t prove him right or wrong, but it sounds good to me. Every Spring, I buy myself a bale of straw. The local supplier of animal feeds and farm supplies sells bales in two sizes, and I always get a good-sized bale as I find it has many uses in the garden. In these days of water conservation, a mulch of straw in the vegetable beds keeps the soil nicely moist and warm, and as it breaks down it provides wonderful humus and porosity to the soil. Mulches in general protect the soil from driving rain (or sprinklers), prevent a crusting-over in the sun, and keep it from blowing away in the wind. Straw is inexpensive, widely available, and will break down over the year. Some people prefer to buy it in the fall and open it to the rain, to start the breaking down process. Certainly when it’s nicely wet it is much easier to control when spreading. In fact, even if you buy it in the spring, wet it thoroughly to facilitate spreading; it’s not possible to control the dry stuff on a windy day! Straw mulch for the ground and containers. By the way, don’t buy hay instead of straw, it’s full of seeds. 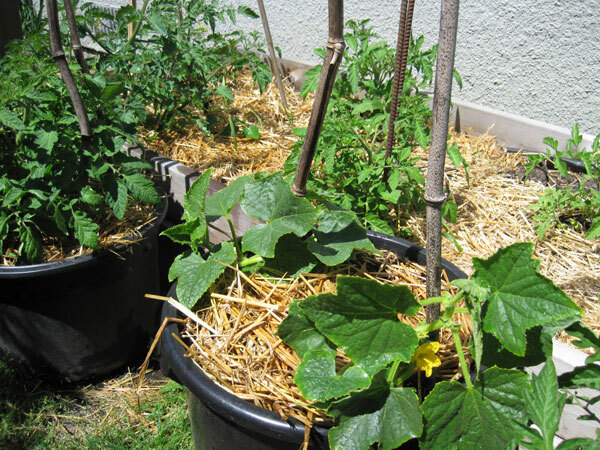 Many avid vegetable growers use straw as a covering for pathways between rows, blocking the sun from the nasty weed seeds, and as part of a winter mulch program along with seaweed, organic fertilizers, and lime. By putting a generous layer of straw around my strawberry plants, the slugs seem to be discouraged, and the berries remain clean, all the better to eat while standing in the garden. For now, I’m off to enjoy that jug of wine and loaf of bread………some good cheese……….strawberries and raspberries from my straw-mulched beds………..